What should you expect if you decide to upgrade your existing ACT! 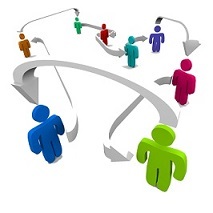 contact management software to an installation of SalesLogix customer relationship manager? How do you prepare for migrating from a contact management system to a CRM- customer relationships management system? Let's be very clear here: migrating to SalesLogix means a different way of doing business. When a company is ready to upgrade, it's probably experiencing situations where ACT! can no longer adapt, and it's actually constraining business practices. SalesLogix gives the flexibility which is needed to grow the business as you wish, but it comes with a certain amount of responsibility. A sophisticated, customized tool like SalesLogix can only be used to its fullest potential if there are solid business processes behind it. Between those establishing those new processes and licenses for a much more complex piece of software, the investment in SalesLogix can be several times higher per user. It's important to fully understand the implementation costs, and to compare those to the growth constraints imposed by sticking with ACT!. We can help you determine when it makes sense for you to upgrade. Who handles the upgrade is also tremendously important. The level of expertise needed to customize your SalesLogix and implement it is much higher than is needed for contact management. Your new CRM will touch more departments than simply sales, and your implementation team needs to be able to understand and integrate their operations, as well. Mapping your data is one of the most important steps in an upgrade. Some fields in ACT!, like "Id/status," have become a catch-all for a lot of different types of information. 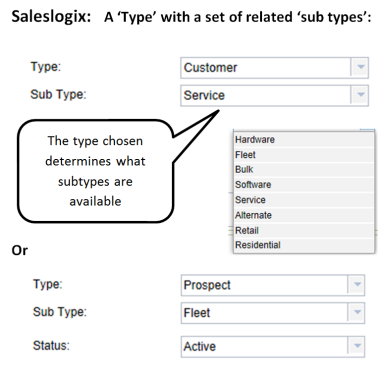 We have to dig in and determine what different jobs these fields are doing, so we can move each different type of information to its own field in the SalesLogix CRM. This allows for better data segmentation for faster and more accurate analysis in the long term. Let's explain that a little more. That field, Id/status, was literally intended for the status of a customer (for example: active/ inactive/ deceased), and sometimes that is exactly what it's used for. However, we have seen it also used to describe the influence role (gatekeeper/ influencer/ decision maker), the contact type (lead/ prospect/ customer), and probably fifty other things, as well. Our team needs a depth of knowledge in your business so that we can sift through and identify all the different things your team uses that field for, and map that to different functional uses and in their own field. What's the point of splitting it out like that? Simple: it gives you more flexibility, not less. It makes reporting more sophisticated and more accurate. It speeds data processing and lookup. It improves communication to a new level. When the system is first rolled out, there can be face-to-face training conference-room style, or we can set up live webinar training sessions which can be recorded and referred back to as often as needed. Saleslogix training site also maintains a Internet accessible video library of training topics, which can walk a user through any activity they're unfamiliar with. Check of Saleslogix training university for specific options. We'd recommend a subscription to the Anytime learning for pre-recorded, online training available 24/7. All you need is a high-speed internet connection and speakers/headphones. Or if your business has personalized forms and specific sets of operational processes, we'd collaborate to generate specifc educational videos. Now the sales team can access new or refresher training 24 x 7 and can keep up to speed. The first people trained on the system will also come from the pilot phase group; they are representatives of each department in your company, and they will come up with the questions that their coworkers will need answers to in order to maximize their new system. Training these key power users makes for a more relevant rollout that engages the users more and speeds adoption. During the pilot phase process, we learn which activities each user will engage in, and make sure that task-oriented training materials are available. Some fits best on that user's welcome screen and other will be available under the "Library" menu as a future reference. We invest in understanding your business termininolgy, rather than force you to adopt different language to fit the needs of your software. For example we have modified "Accounts" to be "Organizations and "Tickets" to be "Client Cases". We've found that properly customizing the menus and data entry screens to each business makes a world of difference in how fast users get comfortable with SalesLogix. If you would like to know more about how to prepare for the upgrade in your particular situation, contact us for a readiness conversation. Why we recommend Saleslogix CRM and ACT!